Every now and then we're blessed with particularly strong anime seasons, batches of new series with a surprising wide range that gives any viewer at least something to treasure. This wonderful fall didn't quite sneak up on us though, there were clues all over the place – particularly within the industry itself. The fact that most people producing anime value well-put-together projects is something not all fans seem to have internalized, even though it feels obvious once you think about it. Having heard the positive murmuring of these directors and animators for months, it seemed very likely that something good was coming. And it did! Let's take a look at some of this season's best-crafted offerings in no particular order, highlighting different elements and approaches that make them special. Just about anything would become a prestige project simply by putting Sayo Yamamoto at its helm. Allowing her to lead another original series focusing on something that she's personally passionate about seemed like a clear winning formula, and so far so good. Yuri!!! On Ice's promotional material put emphasis on the elegant side of the series, showcasing the breathtaking skating sequences that feel like they don't belong in TV anime; there's a reason constant movement sports don't get animated as often as team-based ones with constant pauses, unless the team is fine with taking the 3DCG route. This project went with referenced hand-drawn animation, fully aware of how taxing that would be, and for now they've done an accurate and gorgeous job. And yet the biggest visual surprise was neither that nor the striking color design, nor even Studio Moon Flower's raw background art. As it turns out, the cast is nothing but lovable dorks, allowing the show to be full of amusing cartoony animation. Tadashi Hiramatsu's designs and supervision make it feel fresh, but also weirdly reminiscent of the past – I never thought I would be saying this, but welcome back, FLCL nostrils. The show has more of a heart than it might have seemed, as the cast is humanized through all this exaggeration and visual fun. And credit where credit is due on the directional front as well, it's not only Yamamoto's sensibilities carrying the show – its chief director (演出チーフ/Enshutsu Chief, a rank below hers) Jun Shishido, who was in charge of the first episode and storyboarded the second, appears to be an important factor in the show's particular rhythm. There's something fascinating about the snappy scene progression, allowing no time to breathe but still not feeling overbearing. 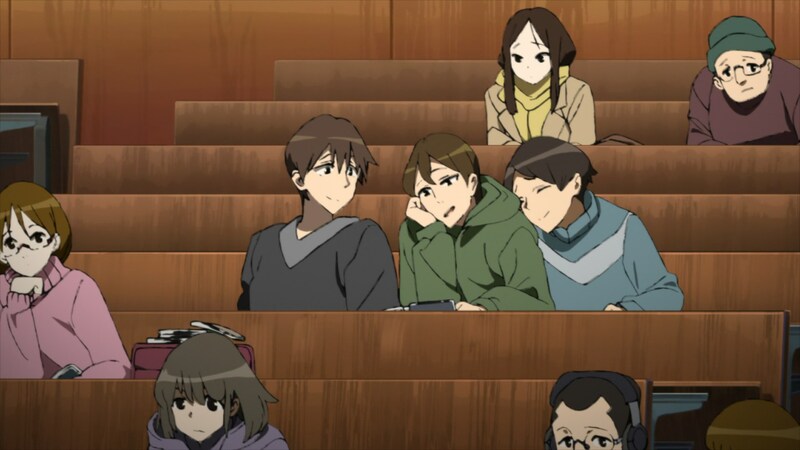 It's aspects like that, plus the fundamentally charming cast, that make the show still joyful even during more mundane technical execution; compared to the outrageously strong first episode, the second one felt more like a pedestrian production, but its core is so strong that I might have enjoyed that one even more. Yuri!!! On Ice sure feels like a keeper. Flip Flappers’ existence doesn't really make sense, at least not in the format it's taken. I refuse to take my eyes off it because it feels like the world might readjust itself if I blink, and if this show is a bug, I don't want it fixed. The series director Kiyotaka Oshiyama had shown up on many people's radars already for good reason; as a youngster he gained important experience on Ghibli films and animation landmarks like Dennou Coil, and after producing episode 18 of Space Dandy pretty much by himself, he confirmed that he was one of the creators representing the future of the industry. 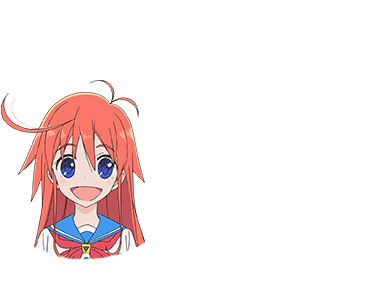 He wasn't going to debut alone either; character animation master Takashi Kojima would give designs a try for the first time with Flip Flappers as well – he's the first of many top animator names to be tied to the project, which skews young for the talent but has also attracted industry legends like Kenichi Yoshida and Toshiyuki Inoue already. There's a point to be made about the design discrepancy between Oshiyama's worlds – always globular, rounded and soft – versus Kojima's very angular work, which doesn't allow for the organic cohesion that existed in his episode of Space Dandy. As a show where the two girls are the foreign elements visiting fantastical settings though, some degree of dissonance feels kinda appropriate – they don't quite belong there, after all. These worlds themselves are brought to life impeccably by Studio Pablo, who fully realize Oshiyama's sets of ideas into concrete landscapes that are simply mesmerizing. If a dry documentary exploring this show's settings existed, I would watch that as well. There is an overarching plot very slowly unfolding, but that might not amount to much after all. 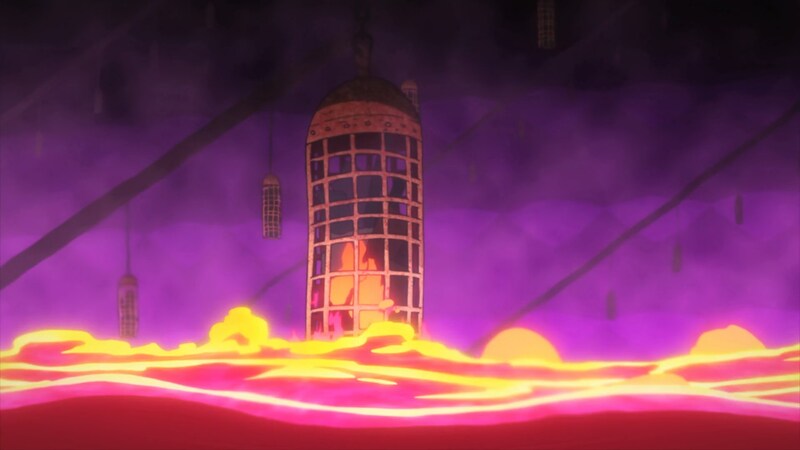 Instead, the viewer has to dig into an alien setting to find out whether a colorful rabbit planet was linked to sexual maturity, and internally built to punish people breaking the rules in brutal fashion despite its fluffy external appearance. Or maybe they just have to find joy in the fact that the snow is sweet. 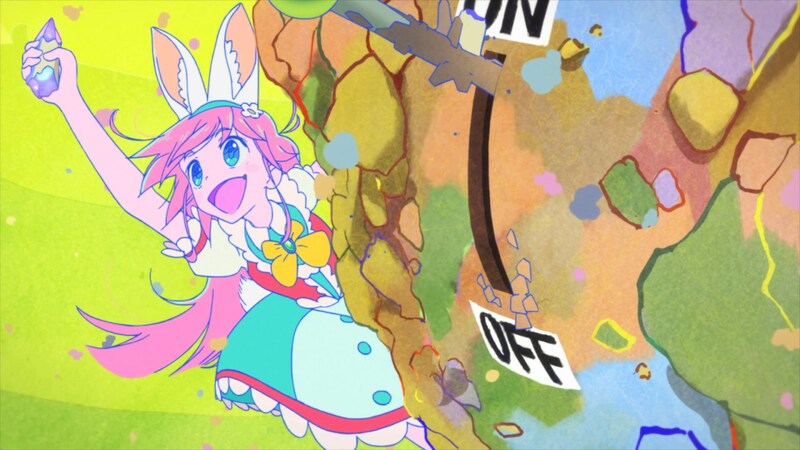 If a normal series attempted what Flip Flappers is doing, chances are that it would end in catastrophic failure. The stars needed to align to allow a genius creator to meet with an art department capable of fleshing out the worlds he envisioned, along with an equally gifted team of animators. Without that impossible convergence of talent, a show banking so hard on the viewers finding the exploration of a fictional setting inherently fascinating would have fallen flat on its face. But it happened. 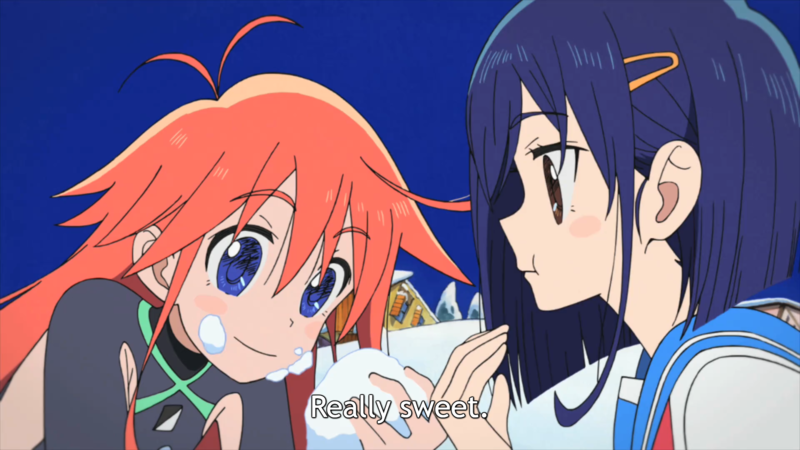 Enjoy Flip Flappers! When it comes to flashy motion, Euphonium pales in comparison to some titles in this piece. Even the amount of movement itself is lessened – not economic by TV anime standards in any way, but it's clearly not the show's forte. If you want spectacular production muscle, look no further than its treatment of the instruments; a colossal 2D mechanical animation effort lead by an expert like Hiroyuki Takahashi, supervising drawings with enough lines to give any animator nightmares. 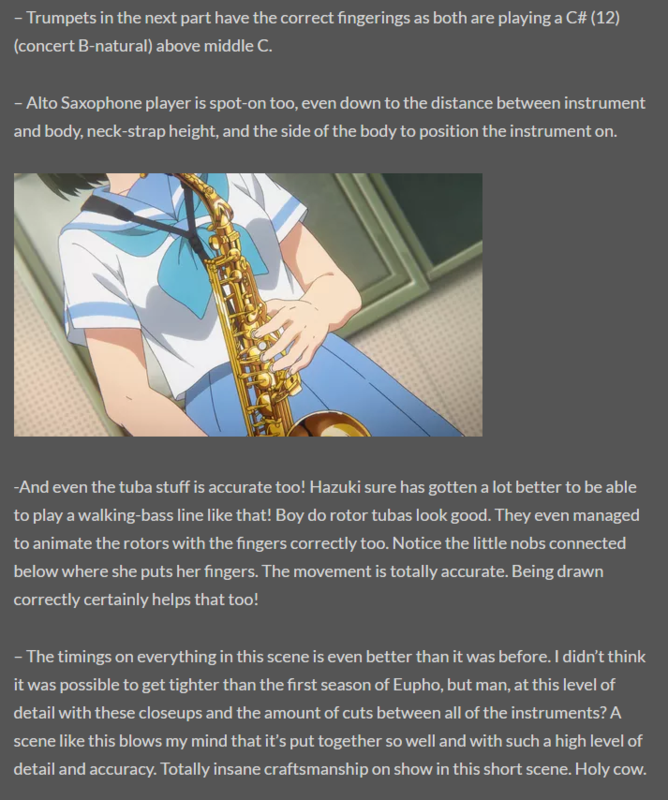 I'm personally not the right person to judge this, but it seems like the accuracy of the animation while playing those instruments only keeps increasing; the staff have mentioned that they obsessively watched footage of concerts, and that seems to be paying off. But that alone doesn't convey the series' core strength. 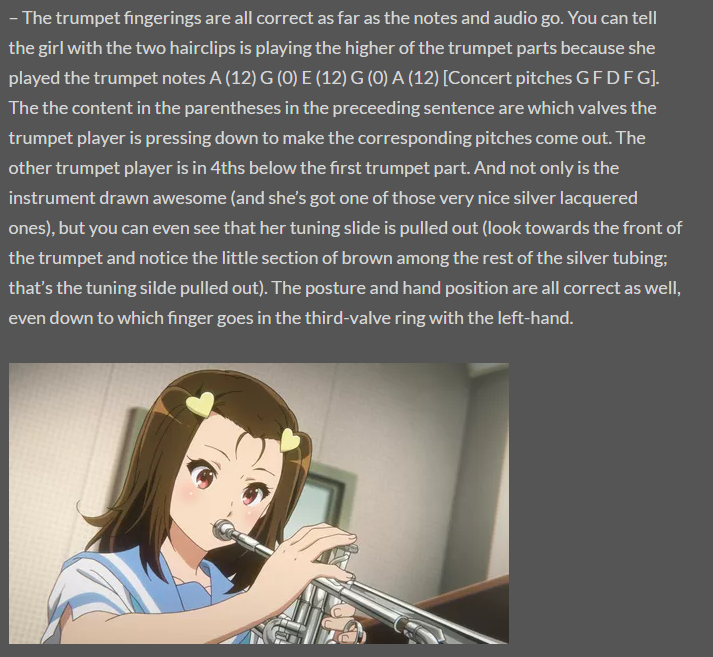 Euphonium is an incredible detail-oriented project, way more about the small things than titanic production endeavors. There's the deliberate acting, which says more about how characters feel than words do. There's the fleshed out setting, displaying as much diversity in atmosphere as a mundane world can, and making sure the world doesn't feel like a flat backdrop that disappears once the camera turns off. There's the intricate yet not obtrusive photography work. There's all the little continuity points quietly reappearing. All of those are commendable details when isolated, and when put together, they create an engrossing piece that's easy to get lost in. A team full of technically strong directors nailing the delivery of a solid teenage passion story is not surprising. Rather than the masterful framing of big moments though, what I find most impressive is the framework they created, in which the everyday scenes are just as rich. And it does have its fair share of spectacular moments, but those stand out precisely because of the general restraint; a key moment in the first season was meant to feel dream-like when compared to the grounded everyday scenes, and now in season two we've already had a beautiful shared moment within a boisterous festival that also contrasts with the tone of their club activities. Euphonium keeps being excellent in a way that feels effortless, but looking at it closely, it's easy to notice how much love has been poured into it. This franchise has always been able to boast about its notable polish; it has suffered some relative dips in quality, like during the second half of season 2 where stock footage had to come to the rescue, but for the most part it sat well above average TV productions. And that's something it achieved without a conservative approach to animation – it's not as if the show manages to have beautiful character art by remaining static. Its portrayal of volleyball is fairly dynamic and motion isn't scarce. Despite not revolving around a contact sport, Haikyuu does a better job at making the player's bodies feel like entities with mass than many other anime that attempt to spotlight this quality. The force of an impact sometimes calls for spectacular exaggeration, but the series has room for realistic momentum and inertia as well – that extends beyond its matches too, since some of its best crafted scenes are character interactions while not actually playing. As if to exemplify its range of character animation, the very first episode of season 3 included a long sequence that says everything you need to know about Karasuno's players with nothing but the characters entering the court; conceptually, you could consider it excessive, since it's essentially reintroducing the cast after 50 episodes, but the amount of character in their motion is staggering. 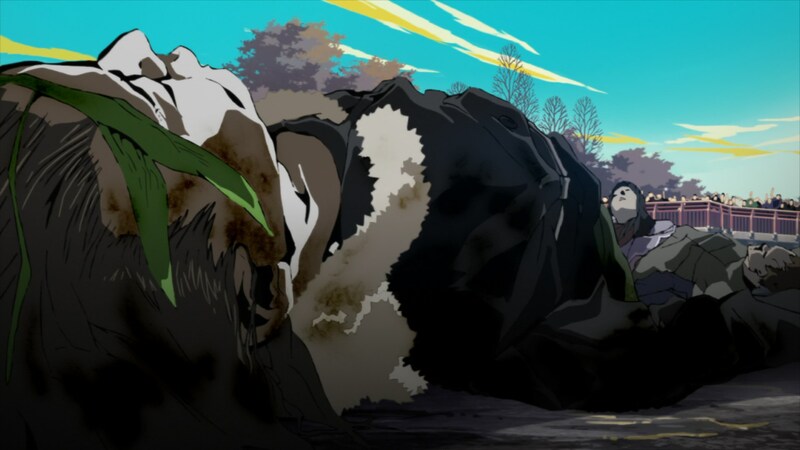 It comes as no surprise that the scene was animated by Takahiro Chiba, one of the show's chief animation directors who should have a great grasp on how all of them are meant to move. This is traditionally not the field this series focuses on, but it still did a fantastic job with the scene. Adding these new features to the list of the series' strengths – like its grasp of tension within important matches – can only mean good things. Whether you're invested in the teams or not, it's hard to resist the gravitational pull of Haikyu at its best. An entire short season covering only one game has the potential to be a thrilling spectacle, and its solid draftsmanship is undeniably part of its appeal. Calling this series hectic isn't only an understatement, but also possibly too kind to it. 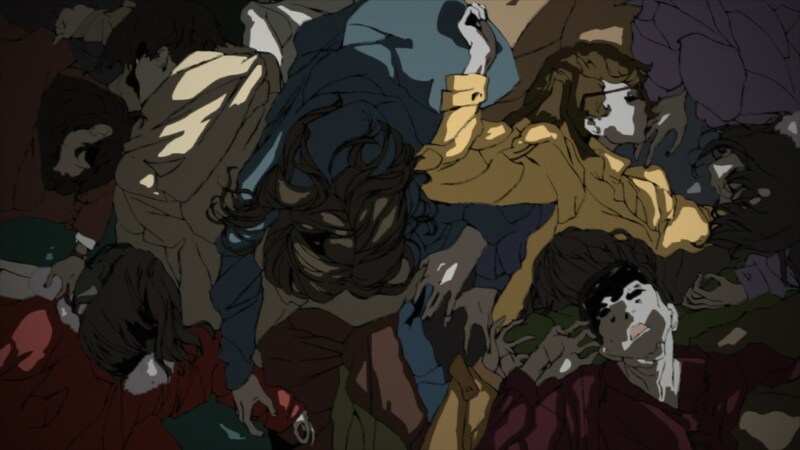 Occultic;Nine is a mess. Unlike your usual disaster TV anime project though, it's also a thoroughly impressive artistic effort; not without fault – the overfiltered lineart makes it look like an SD show at times – but with plenty of elements to love. 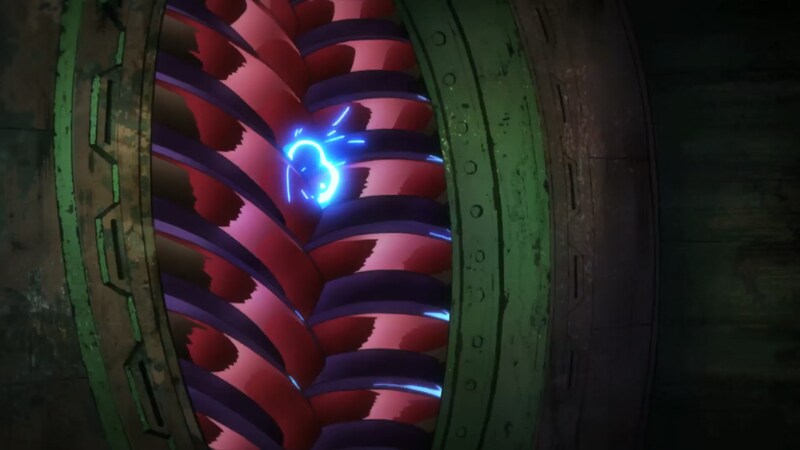 The project has attracted plenty of The [email protected]'s animation and directional crew, possibly a bigger overlap than any previous A-1 production, and that's a strong step towards technical excellence. And the guest artists are on par – starting with Hisashi Mori's haunting pile of corpses was a strong declaration of intent. The lavish character animation is easily above any other show this season, perfectly portraying tender moments… or energetically depicting awful stereotypes. Kyohei Ishiguro's directional talent is similarly impressive yet fundamentally compromised; his storyboards are full of eye-catching moments, and it feels like he could make something powerful with the horror themes. But even when these conceptually strong isolated scenes happen, the progression is too chaotic to allow them the impact they should have. If the delivery slowed down, there would be some genuinely excellent moments in here. There's no getting around the inherently poor material and irritating characters, but the series could easily be elevated by its execution if it was allowed to relax. And yet there's also something bizarrely compelling about its madness as is – it's a show featuring a group of overly excited nerds that's way too enthusiastic for its own good. In a season unusually full of solid projects, even a failure gets to be memorable. Unless we're dealing with short series that can truly be a personal passion project, anime production is an ensemble effort, even more than people seem to realize. It's not just because of the sheer number of people involved – easily in the hundreds – but also because of the many fields they all specialize in. As much of a collective endeavor as it is though, there are artists with a screen presence strong enough to overshadow everyone else. There are some projects that, with all due respect to the entire team, feel like they are carried by one individual, and to some degree that is the case with Izetta. Its Action Animation Director and renowned character motion prodigy Tetsuya Takeuchi steals the spotlight on a weekly basis, whenever there's any events that could be qualified as action – be they straight up fights or a chase sequence. Takeuchi has been the top key animator for all 3 episodes so far, having drawn pretty much all the frenetic moments himself (he even worked on the opening), and his animation is always enchanting, even when it's just hair and clothes flapping. He's always had solid drawing fundamentals and understanding of how bodies operate, but his appeal goes far beyond that. His animation is simply charismatic, and that by itself can make the show's setpieces exciting to watch. Keeping up this output might sound impossible, but whenever he takes on the role of main animator – like he did in My Teen Romantic Comedy SNAFU TOO! – he somehow manages to work on pretty much the entire series. And since Izetta is structurally a successor of sorts to projects like Sword Art Online (where he already worked extensively), chances are that his Action AD role will have as huge a responsibility as it did there. Just like the witch might be capable of defeating an entire army, Takeuchi can carry the project's biggest loads by himself. And that's it, except not really. While I feel that covers many different approaches to animation pretty nicely, there are still even more notoriously well-produced fall series. It's a shame The Great Passage is trapped in licensing issues with Amazon, because Toshimasa Kuroyanagi's naturalistic approach to direction and Hiroyuki Aoyama's realistic yet with room for fantasy character animation are delightfully compatible; the former's work doesn't always have the gravitas to pull some of the most ambitious sequences, and it's rather questionable that the series will able to keep up the level of motion shown in the first episode, but the show seems like an easy pick if you dig low-key series. Even more troubled productions like March Comes in like a Lion have incredible highs – the masterful framing of the protagonist's solitude and inner worries feel like they belong in a much better series than it's attached to, but they're an integral part of the series so that alone might be worth your time. While the ridiculous number of new series being constantly produced might very well be anime's downfall, it also allows for seasons like this with more anime than you can handle if you're an omnivore, and at least something to enjoy if you have more niche tastes but still appreciate well-crafted series.